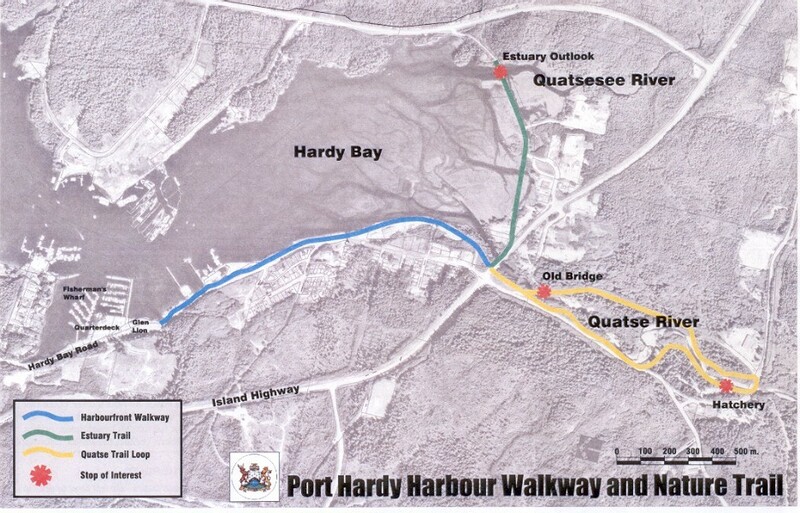 Port Hardy offers a diverse parks and trails system for people of all ages and abilities. From the easily accessible Carrot and Rotary Parks to the rugged Fort Rupert Trail, outdoor enthusiasts will enjoy the diversity offered by these amenities. The area also offers many neighbourhood green spaces and playgrounds, plus a multi-purpose field at Ring Road Park that is used by youth soccer, baseball and other team sports. The Regional District of Mt. 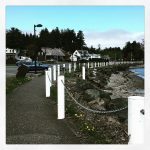 Waddington also maintains a beautiful coastal trail, called the Tex Lyon Trail, which stretches from Storey’s Beach (starting at Fort Rupert) to Dillon Point. In the heart of the downtown is a waterfront walkway that offers more than a quarter mile of promenade space, teeming with wildlife and an unlimited supply of fresh sea air to enjoy. The stroll begins at Rotary Park, where two family playgrounds, public washrooms and the informative Visitor Centre are located. 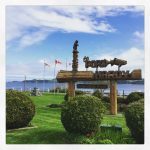 Along the route is the Japanese garden dedicated to Numata (Port Hardy’s sister city), the cenotaph honouring those who have served our country, a ‘Welcome to Port Hardy’ sign that is a photo moment for every visitor, the playground and the Kinsmen barbeque pavilion. Carrot Park is the location of the unique monument remembering years of effort to persuade the Province to extend its road network to the northern tip of Vancouver Island. a paved route for both walkers and cyclists that extends from the Glen Lyon River towards the Quatse River and Estuary Trails. 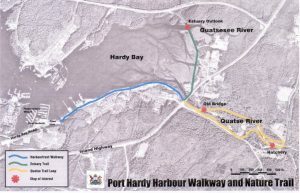 Follow the paved walkway along Hardy Bay, through Hardy Bay Industrial Park and continue on to the bridge at Highway 19. At that point, there are a choice of two routes: one route leads to the Estuary Nature Trail while the other goes to the Quatse River Nature Trail. Climb up, cross the bridge and continue through Sunny Sanctuary Campground to the Estuary and out to the viewing pavilion. 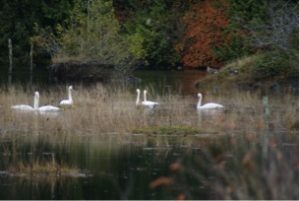 This area is a haven for marsh and sea birds, marshland plants, as well as a safe habitat for rabbits, deer and other small animals. Go under the bridge to walk the Quatse River loop where you may see bears, salmon, steelhead and trout. This is a gravel surface trail with some boardwalk that makes a circuit of nature trails on both sides of the Quatse River, and passes by the Quatse Salmon Stewardship Centre – a must-see for visitors. Beaver Harbour Park is a beautiful recreation area set against Storey’s Beach, a fun in the sun sandy beach that goes on forever when the tide is out. This is a popular family picnic area that offers a covered Rotary pavilion, barbecue pits, tables nestled under the trees, three ball fields, the Fort Rupert Curling Club and a forested area ready to explore. The north end of Storey’s Beach is also the stepping off point for the Tex Lyon Trail, a Regional District of Mount Waddington Park that offers a challenging 12-kilometre trek to Dillon Point. This trail offers a wonderful adventure, but you need to be prepared before experiencing it. Tell someone where you’re going and when you expect to be back, check the tide schedule, allow eight hours for the round trip, wear good hiking boots (no sneakers) and be aware of wildlife. 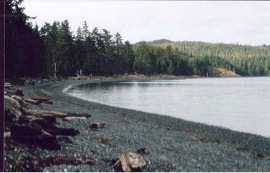 The Fort Rupert Trail starts near Storey’s Beach and extends to Bear Cove Road. 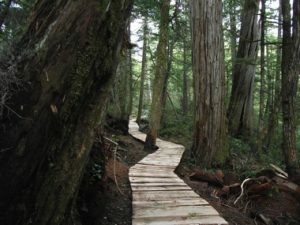 This 3.7 km trails follows the traditional route the Kwakiutl First Nations took overland to Bear Cove. The trail includes board walk and a crushed gravel-type surface, and some uphill terrain. It is not uncommon to see many different types of wildlife, including black bears, along the trail, as well as culturally modified trees.